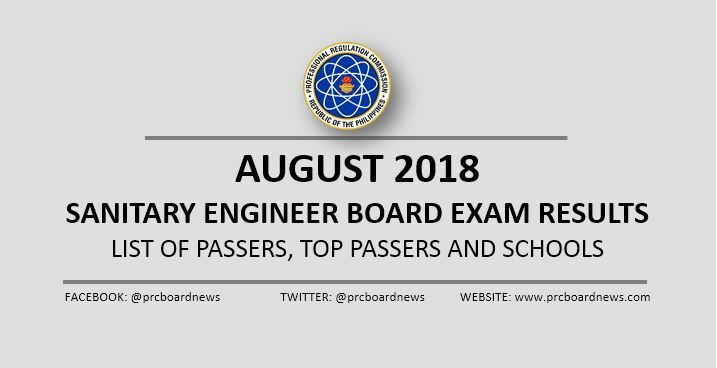 MANILA, Philippines - The Professional Regulation Commission (PRC) released official results of August 2018 Sanitary Engineer board exam, which include the full list of passers, topnotchers (top 10), top performing school and performance of schools expected today, August 14, 2018 (Tuesday) or in three (3) working days after the exam. As announced, 107 out of 157 passed the exams. The Sanitary Engineering board exam was administered on August 7, 8 and 9 in the city of Manila. From August 20 to August 24, 2018, registration for the issuance of Professional Identification Card (ID) and Certificate of Registration will be done on-line. Please go to http://online1.prc.gov.ph and follow instructions for initial registration. All takers may verify their ratings online through PRC verification of rating page. Just enter the required information in the appropriate fields to verify your identity. The three-day examination covered the following subjects: environmental engineering, public health engineering (August 7), sanitary science as applied to buildings and civil engineering (August 8) and waste water engineering and water supply engineering (August 9). According to PRC Resolution No. 2017-1068, the target release of August 2018 Sanitary Engineer board exam is on Tuesday, August 14 or in three (3) working days after the test. In the January 2018 Sanitary Engineer board exams, a total of 50 out of 96 passed the examinations. National University (NU) - Manila led the schools with 100% passing rate or 11 examinees passed. In the August 2017 exams, PRC announced results in three (3) working days after the exam. A total of 80 out of 155 passed the exams. De La Salle University (DLSU) - Dasmarinas led the schools with 87.50% or 7 out of 8 successfully hurdled the tests. Monitor announcement of results on this page or visit the official website of PRC (prc.gov.ph) for more information. thank for sharing with us!